Serving Arizona For Over 20 Years! Most homeowners are faced with deciding which is better, Spray Foam Insulation Vs. Fiberglass Insulation. Whether it’s a new home you’re building or an older home where you’re removing insulation and installing a better alternative, you want to know you’re making the best decision. Two popular options in Arizona are spray foam insulation and fiberglass insulation. Both of these options are installed between studs in attics and inside walls. The U.S. Dept of Energy stated that a lot of older homes have damaged, inadequate, or improper insulation when compared with homes today. They went on to state that new insulation can pay for itself in just a few years. This is especially true for homes in areas that experience extreme heat or cold. Spray foam insulation is unique in that not only does it act as an insulation barrier, but expands into tiny gaps and cracks. This seals off many of your home’s air leaks, to keep you cooler in summer and warmer in winter. Open cell spray foam expands to an incredible 100 times its original volume in just seconds. The primary components of spray foam are an organic chemical compound made from petroleum extracts and water. It is mixed and blown onto the inner wall and attic surfaces to seal the home and insulate it. These are just a few of the pros for spray foam insulation. Spray foam insulation does cost more than traditional insulation up front, yet it is a more effective insulation option. Over time the difference will get paid back with superior performance. Fiberglass insulation has been installed in homes for many decades. It is comprised of extremely fine glass fibers which reinforce a pillow like plastic. The fine glass is added to increase the overall strength of the insulation and help it resist sagging. It usually comes in one of 3 types, loose fill, rolls, or batts. 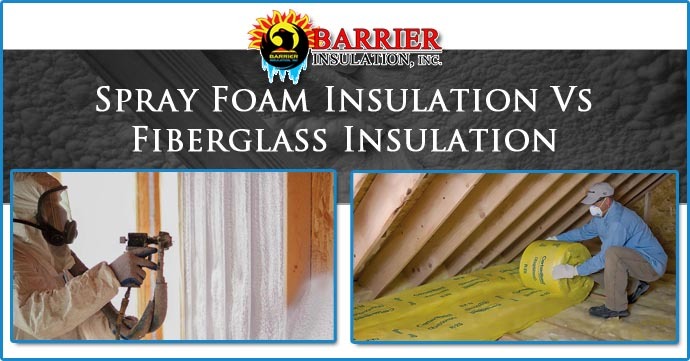 Fiberglass insulation has the advantage of being relatively easy to install and simply costs less than spray foam. While it might be easy to install it simply doesn’t seal off your home from air leaks and isn’t as efficient. In addition there are some health and safety concerns in handling the insulation and a potential for mold in the insulation if your roof leaks. Which Insulation Is Right For My Home? Which insulation you choose will be based largely on a few key factors. Your budget for installing insulation is one of these key factors. Another consideration is how long you intend on staying in the home. If you plan this house as your last move, then the added cost of installing premium insulation will pay you back for years to come. If you are planning on moving soon you may still consider spray foam insulation as it will increase the overall value of the home. Ultimately the question of which will be best for you, your home, and your budget is a conversation for you and your professional insulation contractor. How Much Does Attic Insulation Installation Cost? Copyright © 2010 - 2019 Barrier Insulation Inc. | All rights reserved.